Gulu Mayor George Labeha… has ordered the demolition of grass-thatched housing in Layibi and Laroo divisions as the municipality works towards gaining city status. “Not all residents will be affected, we are targeting areas such as Cereleno, Industrial Area and Limo Sub-ward.” Of course the decision did not go well with some residents, who argue that grass-thatched huts are part of their culture, and development will not force them to abandon them. They added that some of them cannot afford to buy iron sheets. 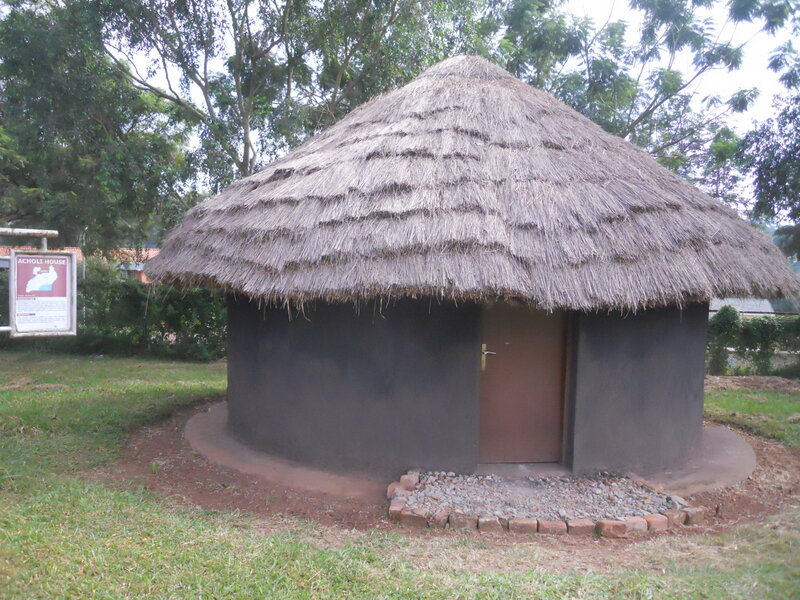 Replica of an Acholi house at the Uganda Museum. It reminded me of my friend Camille’s talk on slum tourism in South Africa (I live-tweeted pieces of it). During the question-and-answer segment after her talk, someone asked how depictions of townships as authentic Africa influenced African perceptions. She responded that, when asked where “the real Africa” was, whites often referenced the townships while blacks pointed to the rural homelands. From what I’ve seen in Kampala and Kigali and Cairo, cities can be African, but this news from Gulu seems to say that one aspect of being African is not compatible with being a city. That’s not to say that housing that isn’t a hut isn’t African, just that these houses are also African, and all types of housing should be acceptable for a city such as Gulu. I hope that the municipality can find a way to develop into a city, if that’s what is wanted, without shedding the grass-thatched housing elements of the town.